I work with American Girl and the American Girl Doll Store. All opinions are my own and not swayed by outside sources. Both of my daughters are OBSESSED with American Girl. Hayley became obsessed when she was around Tay’s age and now Tay is obsessed! We even had Hayley’s birthday party at the American Girl Doll Store. They share a special armor and closet to keep all their American Girls and love to play with them. Hayley usually takes the lead and Taylor joins in. American Girl is near and dear to all of our hearts. As always, American Girl introduces a new Girl of the Year when it is the start of the New Year. This year the American Girl of the Year is Blaire Wilson. Blaire is a young chef-in-training who loves bringing people together, which is so important to my family and I. She is a natural person who excels at gathering people around the dinner table but needs help finding balance between the digital world and the real world—like many people today. Can’t we all relate to this?! Through the American Girl of the Year, girls like my two, will learn the importance of staying connected to the people they care about and truly being there for each other. Time to put down those cell phones and start making real memories around the dinner table and beyond. Not only do we love what Blaire stands for but she is beautiful with bright green eye and curly red hair. Blaire’s world features an array of outfits, accessories, and products that reflect her life on Pleasant View Farm, including a sweet lamb and piglet, festive party decor, and Blaire’s Family Farm Restaurant, with everything needed to play out a show stopping farm-to-table celebration. My children absolutely LOVE Blaire and truly what is there not to love! Blaire’s Family Dinner Series: To promote mealtime togetherness, families are invited to attend a Blaire-inspired dinner series at select American Girl Doll Store retail restaurants across the country in 2019. Parents can visit American girl com/stores to learn more or make a reservation. 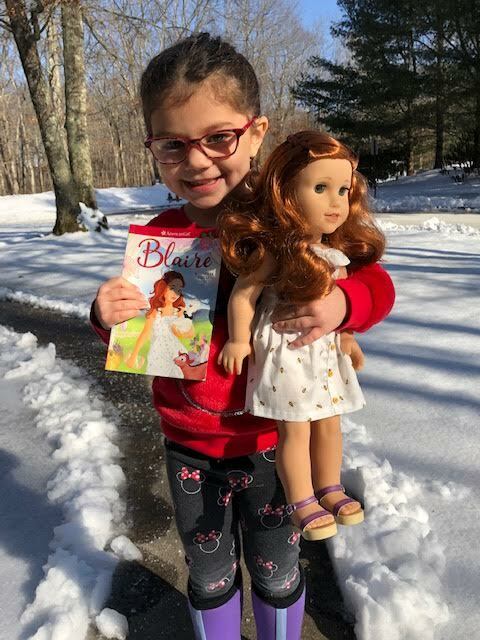 The Blaire collection is available at americangirl.com; at all American Girl Doll Store retail locations nationwide; and at American Girl specialty boutiques at select Indigo™ and Chapters™ locations in Canada and online at Indigo.ca. The Blaire books can also be purchased through retail and online booksellers. To request a free catalogue, call 1-800-845-0005; to join the company’s loyalty program, AG Rewards™, go to americangirl.com/REWARDS. 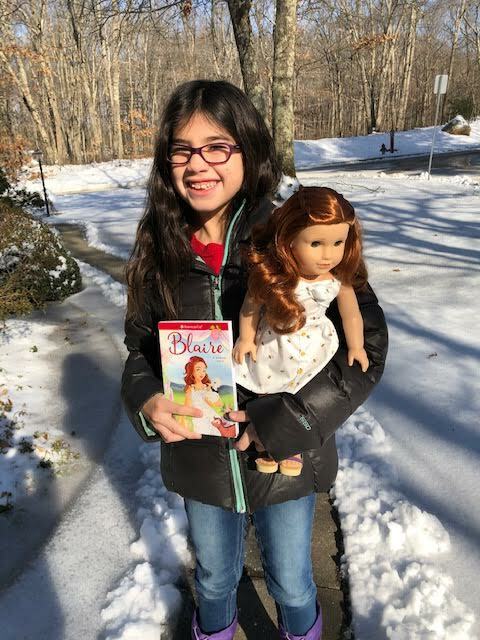 GIVEAWAY: One winner will receive Blaire, The American Girl of the Year. This giveaway is run via rafflecopter so click read more to see the actual giveaway. The only mandatory entry is to visit American Girl and tell me what your child’s favorite girl is, in the comment section proceeding this post. While the other entries are optional, I highly suggest filling them out to increase your chances of winning. US ONLY. GOOD LUCK! My daughter loves Blaire! But she also likes Wellie Wishers Willa. My girls would be fighting over this doll! My 10 year old has been into American Girl dolls for years and my 5 and 3 year olds are starting to get into it too! My oldest daughter’s favorite doll is Samantha! I really like Nanea Mitchell and her Polynesian style. I visited your SATURDAY’S TOP FIVE LAUGHS! post. I think my favorite is Rebecca Rubin. I like them all but will say the cute American Girl Swimming pool is my favorite item. We love all of the AG dolls but would have to pick Blaire since she is the newest! I love the Blaire doll the best and second is the Camille doll. I love all the historical dolls like Kit, Melody, and Kaya! 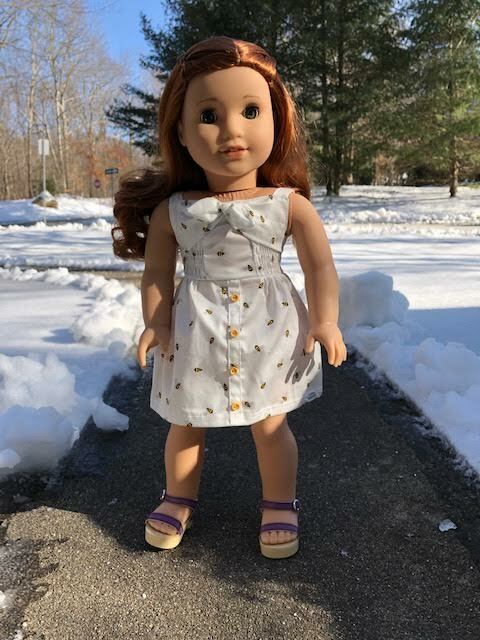 We have the Wellie Wishers Kendall doll which my daughter absolutely loves. She said her other favorite is Willa also from the Wellie Wishers series. I love Josefina! My 4 year old granddaughter resembles her so much. We were able to get my little girl a Truly Me doll, which is lovely. She’d like Luciana & I think Nanea is beautiful! I like Felicity the best followed by Kit and Rebecca. Blaire is actually my favorite doll because she looks just like my niece! They both have red hair. I like the Nanea Doll. I like the Maryellen doll because she has such cute accessories. My favorite is Rebecca, love her outfit! I like the Maryellen doll. She has a really cool Airstream travel trailer! Samantha is my favorite doll. I think Kaya is a really pretty doll. But I also like Julie, with her hippy look. The other post I visited was https://www.the-mommyhood-chronicles.com/2019/01/baby-poppy-pillow/ What a neat baby shower gift it would be. MaryEllen is our favorite doll! I like the Truly Me Doll #23. She reminds me so much of my daughter. Kit or Felicity is my favorite doll! I love the Luciana Doll. My niece would love her, too. My Granddaughter LOVES Blaire the best. She loves her activities and her beautiful hair. I love Blaire also, she has red hair like our Blair. My daughter’s favorite doll is MaryEllen Larkin. Camille would be a perfect for my Granddaughter. It’s so hard to choose a favorite. I like Julie from the 60’s. Luciana Vega: Smart and hispanic! My daughter is in love with Maryellen Larkin. The 50s outfits are great! My daughter is obsessed with outer space and wants to be an astronaut so we’ve both always love Luciana, she is such a pretty doll and has such an awesome message. I like Rebecca. Thank you for the giveaway! My favorite is Kit Kittredge. Blaire, because we own a farm and my daughter loves her animals and our farm fresh strawberries. My favorite is the Truly Me doll. My favorite of the dolls is Kit Kittredge. Samantha was always my favorite! I like the Julie doll. I like her style! My favorite is Nanea Mitchell. I like the Julie Albright™ doll. My daughter will be 4 next month 2/6 and this last year for Christmas she wanted an American girl doll. Since it was her first doll my husband and I wanted to make it special. What we found was our daughter soul mate doll lol Grace Thompson. Our daughter name is Grace, she has dark hair like grace, is actually fascinated by French culture, our first dog looks just like bon bon, and she is born the same year Grace was released. We were shocked and excited. We put Grace in her box at the bottom of our stairs, and x mas morning she was the first sight Grace saw, and they have been inseparable ever since. I like the Truly Me™ Doll #76 + Everyday Accessories one. I think it would be fun to get a boy one. I like the Julie doll. It’ nice to read your post! This is the store where all little girls’ dreams come true. Am I right? I like Julie best. Julie is a child of the ’70s and so am I. Plus all that beautiful hair she has is fun to play with. I like your MY SATURDAY TOP FIVE LAUGHS-MY KIDS LAUGHS. Felicity – she’s a classic. Kaya is my favorite doll. i was little, so she holds a special place for me. i like luciana the best because she loves science! Oh no! We have to choose a favorite? Haha! I’ve always really liked Julie. I grew up in the 70s, so the 60s/70s clothes make me smile, and the message of empowerment is a good one. All of the AG dolls are great though. When my son was little, he even had bitty twins. My young niece would adore Blaire. If love to win for her. My favorite American Girl growing up was Kirsten. Of the ones now available I lean toward Felicity due to the red hair. My daughter likes Samantha and loves the way Blaire looks as well. I love the Camille Doll as she looks like my granddaughter. I think my granddaughter would pick that one as well. Too funny. kids are a great source of laughs. Felicity Merriman™ would be one that I would give to my niece I think that she’d love this so much. One of my girls loves Nanea and the other Luciana. They love the different stories that the girls have! Blair is my favorite — love her beautiful red hair. I love the headbands, my grand daughter wears them all the time and would love dressing up with Willa. My favorite doll is Maryellen. I love the Bitty Babies. Molly McIntire is one of my favorite dolls. 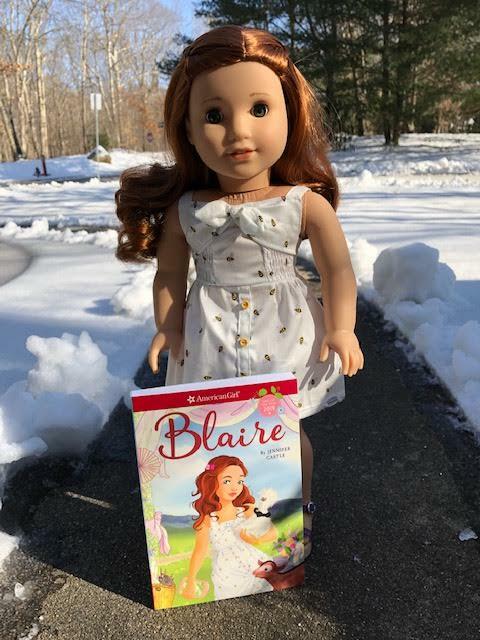 My daughter would love the Blaire doll!! Blaire! I like her hair. Samantha was my first doll that I passed down to my niece. I think she is my favorite just based on the memories. Rebecca Rubin is my favorite. I like the create your own dolls. We adopted a little girl while serving overseas and she is Timorese … don’t worry, no one else has ever heard of the country either, lol … so it’s hard for her to identify with any of the main roll model dolls. She isn’t of African or Indian descent, she isn’t Asian, but something just a little unique. So I like the create your own so I can make one that she can identify with. I like the Ashlyn doll. My granddaughter would like the Julie doll. I like the Kit Kittredge doll. 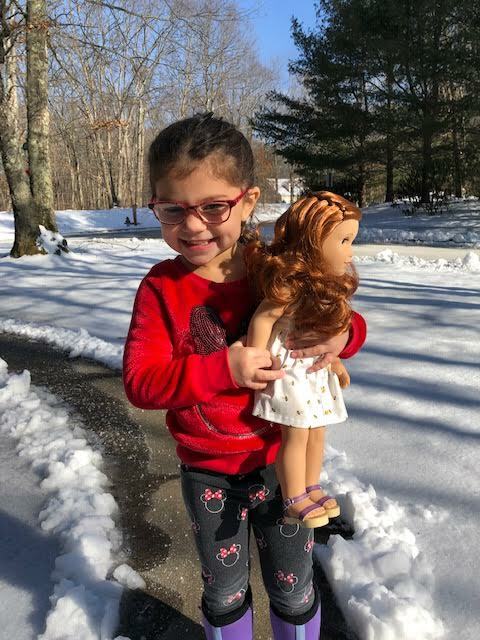 I would love to give the MaryEllen Larkin doll to my little granddaughter Violet. I like Josefina the best! Blaire is super cute too though! The Blaire Doll is my favorite one she is so cute. I do like all the other dolls too. I think my daughter would love Willa!! She is adorable! We always like the new ones and I think Blair Wilson would be a real favorite! She is terrific! My favorite American Girl doll is Melody. Thank you for the chance to win. I don’t have a personal favorite and my daughter seems to love them all. my granddaughter needs this doll. Oh I am in love with Blaire! I would love Blaire for my grand daughter. She is a redhead also. Bree, my daughter is working so hard to save for a doll. It would be so much fun if I could win and she could do something else with her money. Blair would be a fun one, since mommy has red hair. I visited Disney’s the Nutcracker post. My daughter is so into ballet right now. She wants lessons so bad, but we wanted her to learn something more practical first, so we made a deal. She LOVES deals! She finishes her swimming lessons and can swim to the end of the pool and back on her own, and then she can sign up for ballet. She is going to love this movie! I love the Maryellen doll. Her outfit is so cute! Samantha has always been my favorite. https://www.the-mommyhood-chronicles.com/2019/02/best-cooling-pillow/ This was a great review post. I will need to look for these in person and have a feel! My favorite is Julie. She reminds me of my granddaughter and is so wholesome, as are all the AG dolls. My daughter likes Mary Ellen and Blaire. Blaire Wilson Is such a pretty doll I know my niece would love her! Rebecca is my favorite American girl doll. My niece would love one! Samantha is my favorite American Girl doll. I believe i like Blaire Wilson the best. Truly Me™ Doll #33 looks like my granddaughter. I like Molly since she’s from the 1940s, too. I think Blair’s is just the cutest thing. My daughter wants a Rebecca doll so much. The Willa doll is my favorite. She is so cute. My favorite American girl doll is Emerson. I love the Truly Me™ Doll #69. She looks the most like my niece. My daughter likes the Ashlynn doll. My 8 year old daughter would love Blaire! Her favorite doll is MaryEllen and the now discontinuted Caroline. Such cute little dolls. I like Samantha Parkington. My soon to be 3 year old would love the girl of the year, Blaire! I have always been a big fan of Julie…because the 60s were such a turning moment in our history! My kids love the Samantha American Girl doll. Camille™ Doll is one of my favorites. She looks just like my beautiful Great Niece! Julie is my favorite. She’s a little hippie girl! I like the Luciana doll. My favorite is the Luciana doll. There were a few I really liked but to pick one I think I would start wit Camile. My favorite is the Truly Me Doll 66. I like Willa best. She is very whimsical. She is also an animal lover like me. My daughters like Nanea and Rebecca dolls. I visited the CLEAN ANYTHING WITH SONIC SOAK! FANTASTIC ULTRASONIC CLEANING MACHINE post. The Rebecca doll is my favorite!! Blair Wilson is a hair match! Thanks! I would pick Blaire. She grows a garden. If I were to win, I would give this to my great nice who is five. She lives on a farm and I think she could relate to this doll. I like all of the American Girl dolls. I would choose Kit for my little granddaughter, but they are all beautiful dolls. Thanks! 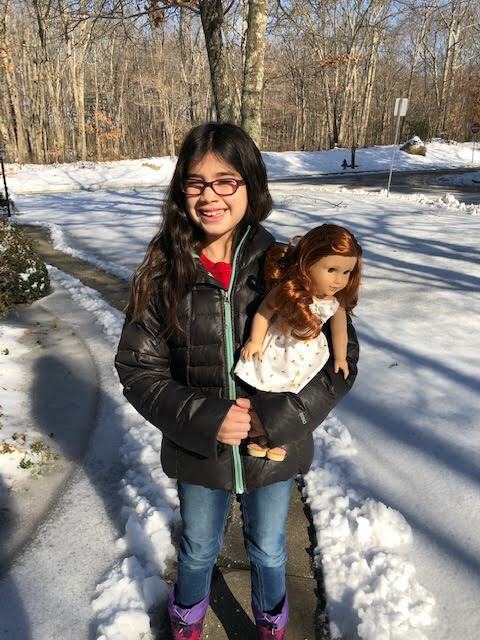 My favorite American Girl Doll is the Luciana Doll. I would pick Blair but my granddaughter has Samantha. I like the Wellie Wisher WIlla doll because my daughters name is WIlla.The doll is also adorable. Samantha has always been my favorite! The Samantha doll has always been my favorite. I had her and all her accessories and books as a little girl. I would like to have one and I would like to win one and the book and the accessories.